Truemag is a premium WordPress theme by StrictThemes that looks great and packs a lot of functionality, including support for responsive Google AdSense and plenty of places for monetization. 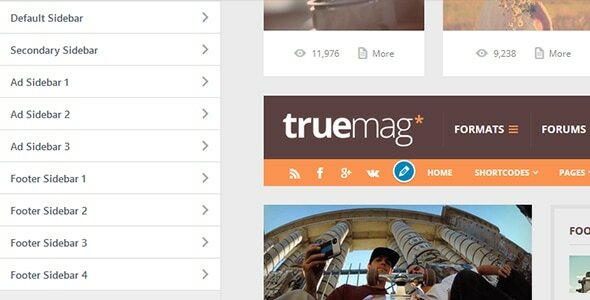 If you want to build a site that sells, then Truemag is a worthy contender. One of the key elements of a successful site is a monetization strategy. By default, everybody assumes that monetization equals ads. Nope. Mozilla’s website, for example, has no ads. They use the website to promote projects, which, in turn, brings in money from donations and partnerships. On the other hand, if you visit a bank website, you’ll notice ads promoting products and services, because banks make money from financial transactions. Why save money for that new Camry when your bank lends the money you need for a small fee and an honest interest rate? You need that Camry now anyway! Get it? Your favorite food blogger has an eye candy site, with a nice color scheme and a giant ad, promoting a book that will make you the greatest chef of all times. In addition, some small ads will point either to the all-new, Bluetooth-enabled spoon or some protein bars that are obviously complementary for your diet. We live in a consumerist society. You can do whatever you want with your hard-earned money, or from your monthly allowance. By the way, there is nothing wrong with using ads on websites. If you are serious about your site, then the goal is to attract at least a few users. As soon as your site gains some traction, your shared hosting will prove to be a bottleneck. The sooner you realize that, the better. You’ll upgrade to a VPS or a managed server and the cost of maintaining your site will skyrocket. Your editors, writers, designers and developers won’t work for free. 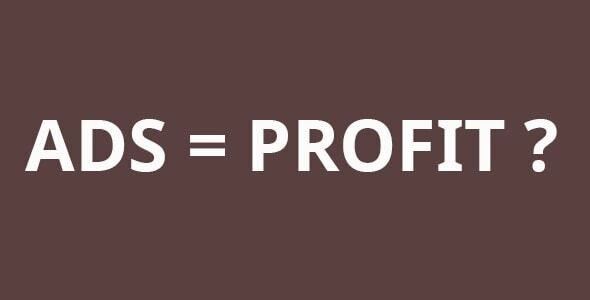 Ads will help you manage expenses and become a source of profit. Use them wisely. Everybody hates pop-up, obtrusive or irrelevant ads and, eventually, users will block them. Placing ads on your website is an art. And it all starts with a carefully designed layout. Truemag has more than nine hotspots for ad placements. Ads can be placed on top of the header, bellow a title, in sidebars, including sticky sidebars, above a post, bellow a post and even in the footer area. Strict Themes’s Truemag WordPress theme ad placements. In addition, the theme features a custom responsive Google AdSense implementation. While most modern themes are responsive and mobile friendly, not all are doing a good job of displaying ads on mobile devices. Truemag avoids the issue of broken layouts with a neat piece of code that ensures that ads are shown properly across all devices and screen sizes. Furthermore, the site scales great to any screen display, and supports HiDPI resolutions. Both content and ads can be displayed beautifully on any widescreen or retina display. Strict Themes, the developer behind Truemag, managed to integrate positions in an unobtrusive and seamless manner along the theme layout. So, if you have great content, your users will be sure they’ve made the right choice when they’ll whitelist your website in their ad blocker. Of course, you don’t have and probably shouldn’t place ads in all those positions. Don’t forget to keep a harmonious proportion between your original content and your ads. While Truemag provides a lot of ad placement possibilities, it’s up to you to choose the right combination. 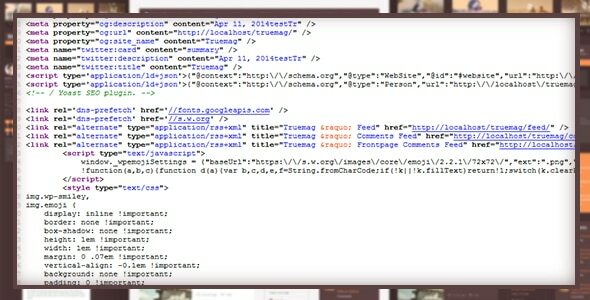 Truemag is built with great semantics, top tier code, and extensive documentation. A good monetization layout is useless if users can’t find their way to your website. Truemag takes care of that. It’s a truly SEO optimized theme, built with clean semantics and fully optimized for search engines. 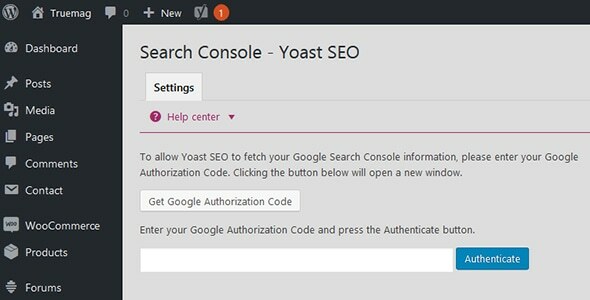 The theme is 100 percent compatible with Yoast SEO, the famous search engine optimization plugin. In addition, the code is made with respect for modern quality standards. Each line of PHP and JS is commented, favoring customizations and enhancements. It’s worth mentioning that the theme is structured logically, without any trace of dirty or bloated code. Tweaking the CSS styles is easy and productive. The whole theme feels polished. The developer keeps extensive documentation for all the themes it develops. Truemag is not an exception. Every aspect of the theme is documented and commented. The documentation is regularly updated, so both beginners and experienced users will find their way easily. Handy video tutorials are available. As a matter of fact, the one click installer took me less than 3 minutes to have an exact copy of the demo version on my test machine. From there, replacing the content, tweaking the layout or customizing the theme is an easy task. While purists may like to build from scratch, it’s really not the case. By default, the theme comes in full-width format, but you can quickly switch to a boxed layout. You can choose from a light or dark style. For an added touch of individuality, adjust the color scheme to represent your brand. Three clicks are what it takes to change style colors. The header can be customized with a graphics or text logo. Since maintaining a social network presence is mandatory, there are built in social icons to redirect users to your social network profiles. Favicons, neglected by many site owners, can be easily uploaded in the same section. 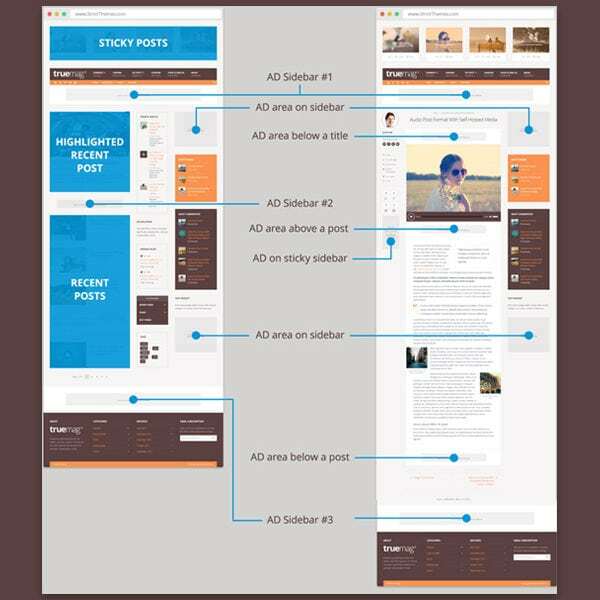 With unlimited sidebar positions that can be individualized for each page, project, or post page, you can build an immersive experience. You can display image posts without distracting sidebars, and switch to sidebars for articles or news posts. And, for product pages, add an additional menu in the sidebar for quick navigation. Just don’t forget to keep a sense of uniformity on your website, or you may confuse visitors. 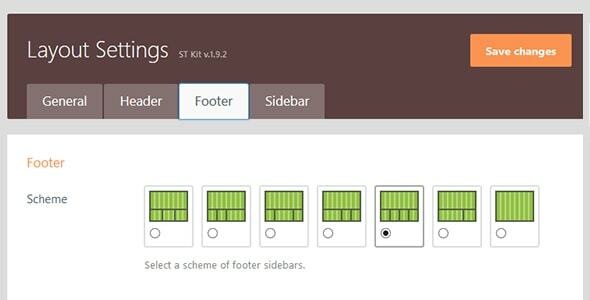 For the footer area, there are six layouts to choose from. So, next to your quick links, you can place contact forms, maps, login forms, etc. Try to keep that area simple yet engaging. 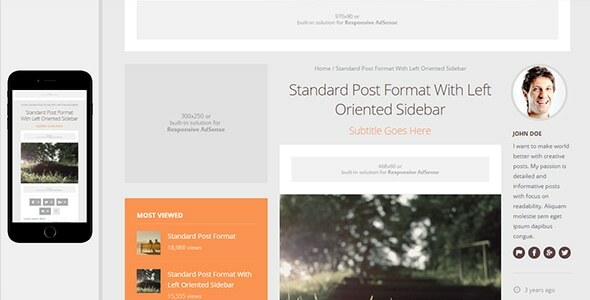 Each post format can be used with left- or right-oriented sidebars and even without any sidebar at all. While not an innovation, each post, project or page can be customized with a subtitle for added functionality and elegance. It’s also great for SEO. For a touch of personality, enable you can enable the view counter and the “Nice time” feature. The devil is in the details. As for typography, the theme uses the Google Fonts library. Some of the best fonts out there are available at your fingertips. Truemag has 18 shortcodes available for greater visual impact. 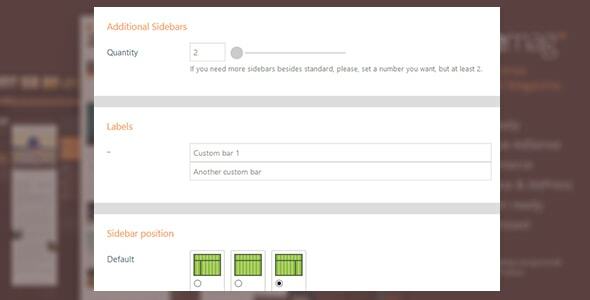 To keep things neat, use shortcodes to display content in tabs and accordions. For those who intend to sell subscriptions, paywall content or other services, a nice pricing table shortcode is available. Highlight your message with the notification shortcode. Truemag comes packed with 130+ universal icons. Use them with buttons for call-to-actions, or for any other functionality you may need. Each button is accompanied by a subtle animation that will add dynamism to your website. Since Truemag is based on the ST Framework, you can use the ST Kit widgets such as ST Sharrre, ST Get In Touch, ST Flickr, ST Posts, and ST Subscribe. The widgets are elegant and functional. All customization options are available from the admin panel. Kudos to Strict Themes for keeping things simple. All the settings are where you expect them to be. 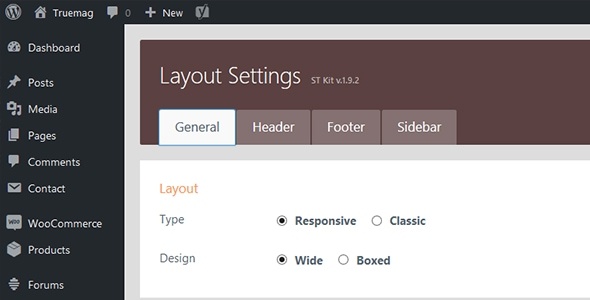 The tabbed interface will help you quickly adapt and customize your theme to your needs. Aside from the initial set-up and the occasional tweaking, you won’t spent too much time in there. Aside from creating great content, its import to build a community around your website. 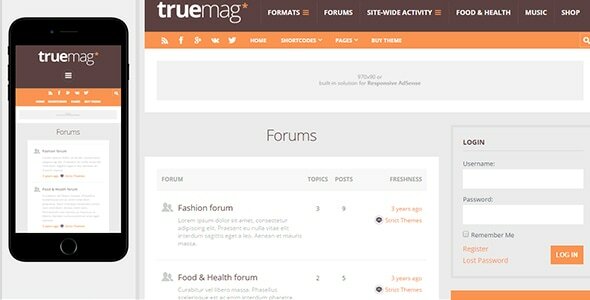 Truemag comes bundled in with both bbPressForums and BuddyPress. Interacting with your users and keeping them in touch with your site has never been easier. Those looking to sell goods on their website will be delighted to know that Truemag is 100 percent compatible with WooCommerce, the popular marketplace for WordPress that powers more than 40 percent of all online stores. You’ll get the option to activate the plugin when you’re setting up your theme. Truemag is translation ready, which is a nice thing to have when you are targeting multiple countries. Those focused on a Russian audience will be glad to know that the theme is fully translated in Russian and Ukrainian. If you use Truemag for your projects, then you won’t have to worry whether it will work in future versions of WordPress. The theme is tested with beta versions of WordPress so when it’s time to upgrade, the one click updater will let you experience the latest version of WordPress without experiencing any side effects. No more broken layouts, errors or missing features. Also, keeping WordPress updated will avoid having your website compromised by malicious code. That’s why it’s important to keep WordPress updated. Finally, when choosing a theme, be sure that the developer is keeping the theme bug-free. StrictThemes promises bug-fixes and real real-time support. The user feedback is positive. 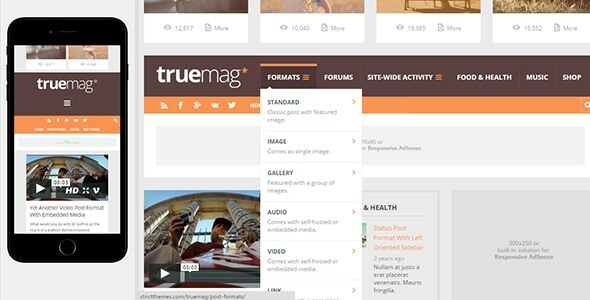 Truemag is a great tool if you are looking for a flexible solution for projects. It works out-of-the-box, and it’s easily customizable. It’s fast, easy to use and lightweight, but, at the same time, has an impressive list of features, including an ad optimized layout. 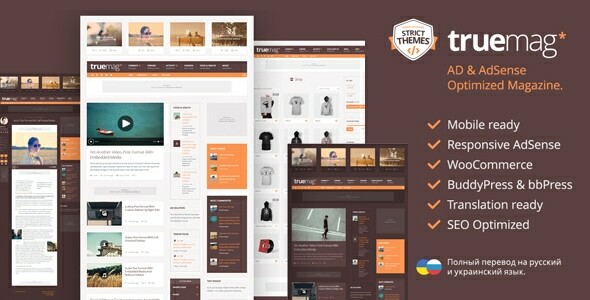 Strict Themes managed to develop a theme that combines functionality with elegance. For a price tag of $69 and a rating of 4.70, you’ll get the best the money can buy. Hey Doru, The TrueMag is an awesome WordPress theme and I’m using this template for one my micro niche site. The site is earning good amount of money compared to other sites.